Plume is a similar app as the Breezometer but a bit more simple on the interface and user experience. The app displays the AQI and a Cloud will be happy or sad depending the air quality in your area. Plume has also its own AQI value called PlumeAQI PAQI but it also supports the USA AQI and China AQI. I haven’t found the breakpoints to determinate if the PAQI is better or not. If you click on the Cloud, you will be able to see more info regarding the air pollutants and a confidence index which will tell you how accurate the data are, 70% is not so accurate and this happens because they don’t take in account a local official AQ station. Plume app offers a map but the colours are not so clear in my opinion. In the settings you will find more options to customize the app depending on your needs. I fell in love with this simple AQI app called Breathe. It will detect the nearest DIY luftdaten sensor, it will take the data and it will display the PM2.5 and PM10 measurements with an AQI value. Colour coded so everyone can understand how good or bad is the air around him. The app supports the same map as the luftdaten.info site and it has an Apple Watch app too. I had the chance to beta test the app and it was the first app I used to check when I woke up in the morning, unfortunately after the beta testing the app wasn’t available in the US Apple Store and I can’t use it any more. I was researching for a good AQI app in the app store when I found the Local Haze. It is similar to the Breathe app but this one combines data from many sources like Luftdaten (beta), PurpleAir, AirNow, US Department State and more sources are coming. It eliminates the need to check the AQI from various apps. It uses the GPS of your phone to determine your location and lists the nearest AQ station/monitor to you. The app works even if you don’t allow it to use your location data but in this case you have to search the AQ station of your choice like I did on the search bar. The map will remember the last place you visited so you can access your AQ data of your area from there as well. At the moment, the app provides some basic PM2.5 information but I see potential. 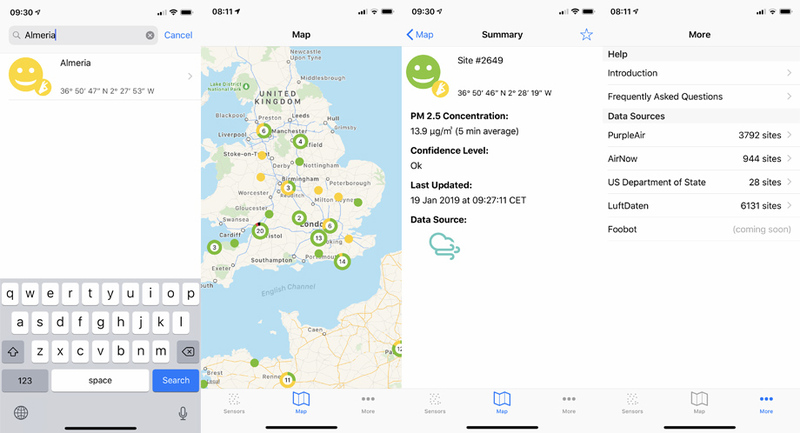 BreezoMeter is a straight forward app, all the information are displayed on a single sheet and you have to scroll down and up to see all the air quality data. On top it displays the current AQI but they offer their own BreezometerAQI BAQI value which is designed to have better breakpoints for each pollutant, I have read the theory behind it and I mostly agree. Later we can see the pollutants concentrations and the most dominant is always in the center of the infographics. AQI Forecast, weather data and a map with the AQ around you are also present. The app lacks advance settings, it only allows you to chance the temperature between celsius ºC and fahrenheit ºF. The app has ads. AirVisual offers a lot of information for the air quality in your area. It also tell you where the data come from, in my case from the European Environmental Agency EEA which are the official data in Europe. Weather data, forecast, maps and a ranking list for the most polluted places in the world are also present. It allows the user to change a lot of settings from user preferences to the notifications that you want to receive. It has a widget for iOS and Apple Watch app which makes it super useful for fast access. I tend to use the widget more often than the app itself because the app is a bit over saturated with info.